I had this awesome idea in my head. . . Banana Cornbread. I really wanted some Pumpkin Cornbread, but to most people, it isn't pumpkin season and it seemed more "Summery" to try a banana version. This is a beautiful marriage between two of my favorites, Banana Bread and Cornbread. 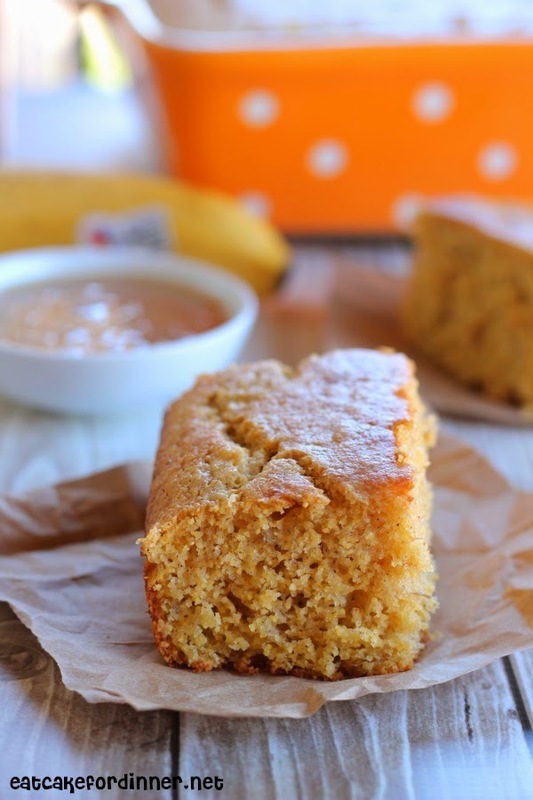 It has the texture of cornbread, but the flavor of banana bread. And - it is so moist. Plus, sometimes we just need something new to try with our over-ripe bananas. I was going to serve it with Cinnamon Honey Butter, but I forgot to get the butter out to soften, so I grabbed the Creamed Honey out of the pantry instead. Have you ever had a Creamed Honey and Peanut Butter Sandwich before? You should make one for yourself (or your kids) and you will be in for a real treat. Creamed honey can be found by the regular honey, jam and peanut butter in your grocery store. I have made mini muffins and regular cornbread with this recipe and I love both. Mini muffins are a lot easier to pack in lunches, but I like a big, thick slice of regular cornbread on a Sunday afternoon! Preheat oven to 400 degrees. In a medium bowl, whisk together cornmeal, flour, baking powder, salt, cinnamon, nutmeg and brown sugar; set aside. In a separate bowl, whisk together the mashed banana, eggs, milk, oil and vanilla. Pour into dry ingredients and stir together until just combined. Pour batter into a greased 8x8-inch baking dish and bake for 30 minutes or until top springs back when lightly touched and a toothpick inserted in the center comes out clean. Or divide batter evenly between a mini muffin tin. Bake at 375 degrees for 8 minutes or until top springs back when lightly touched. Makes: 48 mini muffins. Stir together creamed honey and 1/2 teaspoon of cinnamon until well combined. Taste and add more cinnamon, if needed. Store at room temperature. It is unique, but very delicious! Ha ha . . . you are awesome! Thanks. 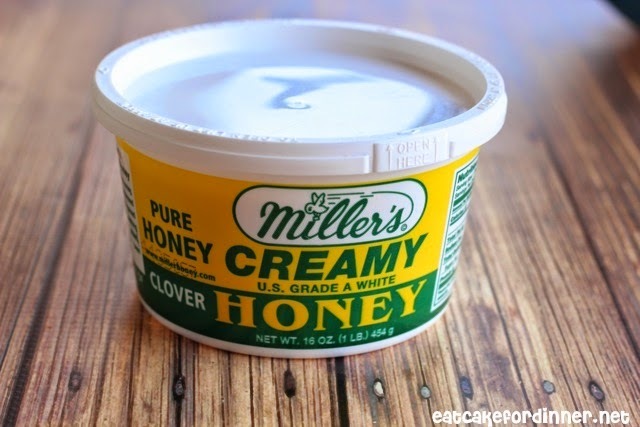 Is there a substitute for creamed honey? Hi Donna! 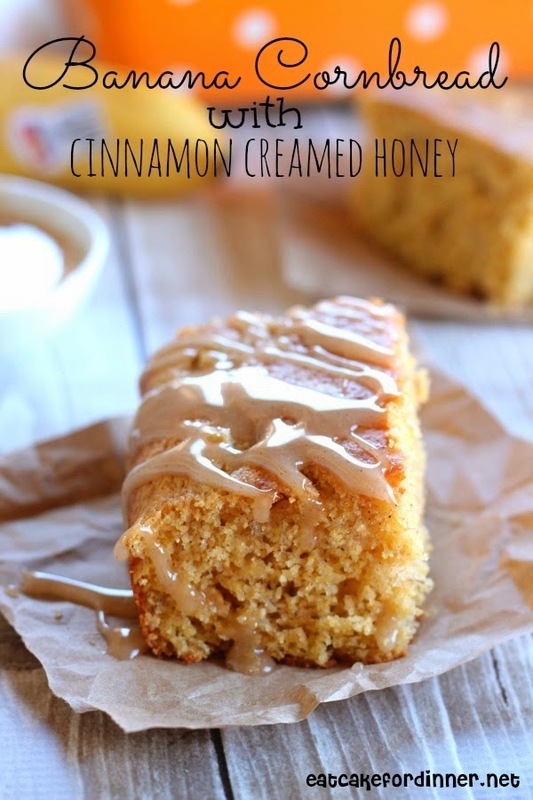 Since the creamed honey is just to drizzle on top, you can always just drizzle it with regular honey or cinnamon honey butter would be delicious. Awesome idea! I've been craving pumpkin goodies and almost made pumpkin donuts the other day. Hehe. mmm . . . a pumpkin donut sounds fabulous! This looks delicious! 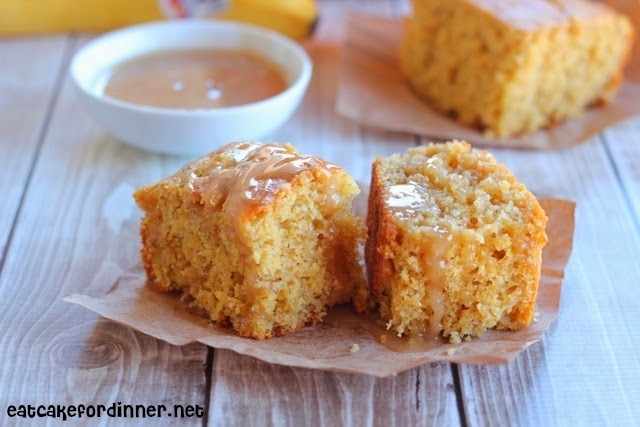 I've never thought of using cornbread as something sweet. Great idea! That is funny, because I never eat savory cornbread. Only sweet! What a great combination! It looks amazing! Mine came out more of a banana nut bread color, yet, it tastes amazing!! I pour some batter, then added rum and banana liqueur soaked bananas, then poured the remaining batter on top!! These are delicious. I didn't make any honey topping, and didn't miss it. Good as is and lighter in calories too. Love the little crunchy texture the cornmeal makes.I used Lamb's Stone Ground cornmeal. This is the recipe I was looking for. I often bake Banana bread and I have several recipes but this one seems it is more tasty than mine.